Birchill Bed & Breakfast offers two spacious and modern Bed & Breakfast rooms with private entrance, private bathrooms, and a full breakfast included in every stay. A horse shoe pit, washer toss game, fire pit, and duck pond are all found on site. There is also access to the onsite Birchill Hot Tub. Birchill Cottage sits on the shores of Spanish Ship Bay next to a small babbling brook. The spacious deck, equipped with a barbecue, is perfect for entertaining or relaxing on the patio chairs. On the lawn is your fire pit with wood supplied, as well as the hammock. There is also access to the Birchill Hot Tub. 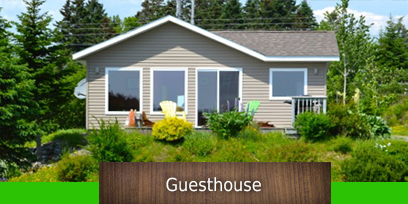 Birchill Bed & Breakfast is a family owned and operated business-providing guests with high quality tourist accommodations for over ten years in Liscomb and Spanish Ship Bay. The Eastern Shore is the least developed part of Nova Scotia and its natural beauty remains unspoiled, which makes it a haven for nature lovers alike. Birchill Bed & Breakfast and Guesthouse features two unique properties. The Bed & Breakfast sits atop of Birchill in Liscomb on a beautifully landscaped property surrounded with natural forests. Look closely and you can catch a view of one of the many local still waters. Birchill Cottage's windows get sprayed with the salt water from the Atlantic Ocean as it rests on the shores of Spanish Ship Bay. Spanish Ship Bay is a part of Liscomb Harbor, located on Nova Scotia’s beautiful and pristine Eastern Shore. Rumor has it that the name originated because Captain Kidd, the famous pirate, used the bay as a place to hide his ships from British warships. Nowadays the bay’s treasures are its tasty mussels and scallops and its picturesque islands teeming with shorebirds and wildlife.